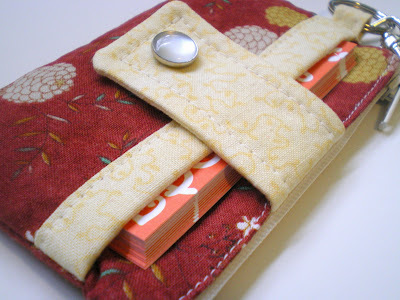 Zippy Wallets in the Shop! 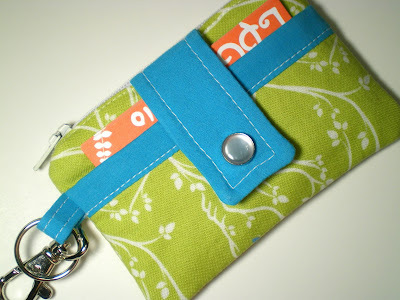 I finished up three zippy wallets yesterday and had high hopes for lots of sunshine for picture taking. No such luck. So, since I reaaaaaaally wanted these listed today I made do with indoor lighting. Not the best photos but Picasa sure does help! I should have more zippys in the shop next week when my big zipper order comes in the mail. Am I weird for getting excited about zippers? Anyways, I think these things are just the coolest. 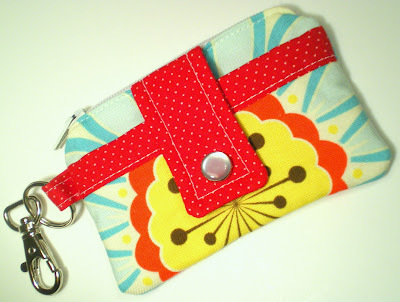 I couldn't decide at first whether or not to include the swivel clips with the wallets but I figured "why not?" That way you can clip them onto your keys, purse, diaper bag, backpack. . . I've got mine clipped to my keys with business cards in the front pocket, in hopes of actually remembering that I have them to give out. I can also see myself using it for my bargain shopping trips. I can keep all my store coupons and loyalty cards in the wallet so I don't have to dig around my purse at check out time.